Sleek! Strong! Sporty! 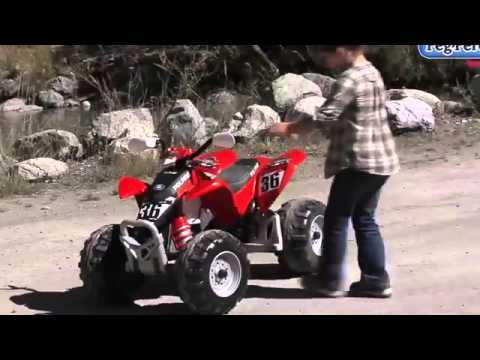 This Polaris Outlaw is so cool all your child’s friends will want one too. Hours of fun and exploration will be had on this all-terrain children's ride on vehicle. With a red color that POPs and true to life details (shocks, fenders and more!) kids will love the realistic look of this ATV. All terrain knobby wheels provide traction on grass, dirt, gravel or pavement. This sporty looking ATV has a foot pedal accelerator and automatic brakes. With a 2-speed gearshift, it travels at 2½ or 5 mph / 4 kph to 8 kph, plus reverse. Parents will love the being able to control vehicle speed with the second gear lockout feature. Keep the fun going with the included 12-volt rechargeable battery and charger. If you’re looking for a faster way to longer fun, check out our 12-volt Quick Charger, which charges the vehicle in 2 hours! Made in the USA. Weight Capacity Can hold up to 85lbs / 38 kg. Weight 41.5 lbs / 18 kg.